South onto the Barra de Navidad Highway toward Mismaloya, there are several interesting residential areas to explore. The hillside sprawl of Amapas and Alta Vista is a cobblestone maze with village charm and character and a precious bird's eye view overlooking downtown and across the Bay of Banderas. 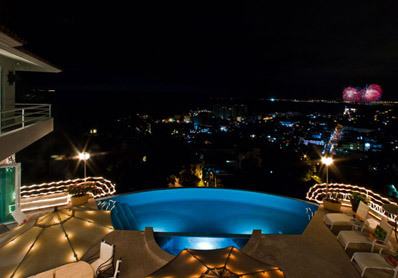 Casa Romantica - Alta Vista - 9 bedrooms with endlessly satisfying views. This residential zone is mostly village condos and houses, with an occasional restaurant and office building. Alta Vista, is the perfect adjective for the zone; nestled in the side of the Sierra Madre Mountains, this neighborhood offers a storybook view of Banderas Bay and downtown Puerto Vallarta. On the other side of the mountain hillside is the neighborhood of Amapas. Amapas is booming. With more than 7 hillside oceanviwe condo projects underway this area is transforming into the premiere location to own a home or condo. Surrounded by lush semi-tropical vegetation and sweeping views to the city and bay, there is no doubt that this area will continue to grow in prestige. Dense with classy villas and boutique condos, The "Beverly Hills of Puerto Vallarta" is where, for generations, the vast majority of expats and retirees have built romantic villas overlooking the bay. This neighborhood extends to both sides of the highway, boasting some of the most luxurious and spectacular homes in the Vallarta area. The vegetation consists of tropical and semi-tropical jungle, offering the perfect opportunity for bird watching or simply a serene walk amongst the towering trees and colorful flowers. This part of town is best viewed from the water, where you are offered an unobstructed view of the homes. Conchas Chinas offers stunning beaches with sections of white sand separated by dramatic rocky outcroppings and pristine crystal blue waters showcasing the vibrant sea life. Conchas Chinas is one of the few completed areas that is completed. That means that you can move in right away and you don't have to suffer the pains of hearing your neighbors house being constructed. Prices start at just under $1,000,000. A mix of classic and modern drama, the dignified classic Vallarta blends with high tech homes and condos. Within a complex or hillside gated subdivision, the South side of Puerto Vallarta offers an excelent range of choices for those loking for secure suburban retreats to relax with friends and family. Currently there are several new developments being planned and constructed in the Mismaloya/Garza Blanca area. Homesite's and newly finished homes and condos in the Sierra del Mar area are also an option if your looking for peace and quiet outside of Vallarta but you still want to be close enough to enjoy all of the amenities the city has to offer. The developments currently underway are in the area are at various stages of development. Check with a La Punta Realty agent for insight as to what is the best investment opportunity. Many discounts and pre-sale deals are waitng to be found. It is still possible to find waterfront homes and homesite's. The prices range from $700,000 to the upper $2,000,000 price range. Most of lower Conchas Chinas has been developed so if your looking for a new waterfront home or lot you will have to venture out towards Sierra del Mar. The small town of Mismaloya, made famous by the legendary late film director John Houston, where he shot scenes for his movie "The Night of the Iguana" amid the torrid romance of Elizabeth Taylor and Richard Burton during Hollywood's goldern era. There are amazing villas like Villa Luna Creciente and Villa Mandarinas along this coastline, but the major developments stop here after the Jolla de Mismaloya Hotel. The last fishing town on the south most part of the bay accessible by car, the highway turns inland into the mountains, toward the majestic shores of Costa Alegre. From Boca de Tomatlan, water taxis provide service to explore the secret South beaches Las Animas, Quimixto, Las Caletas, Majahuitas, Yelapa and beyond to Cabo Corrientes...each tiny village has a unique beauty. There isn't much legally titled real estate available past Mismaloya and the secret beaches beyond are accessible mainly by water. The area remains untamed and uniquely in touch with nature. Many small hotels, and houses can be rented out in these areas. Our favorite spot is called Verana. Locals run delicious seafood restaurants and you can find many activities like hiking, snorkeling or bird watching. During winter months, whale watching is highly recommended, which is easily done from the beach or on a tour. New - Poised on an oceanfront cliff above the Pacific Ocean, Villa of the Crescent Moon offers 6 luxurious bedrooms with an extraordinary view of Banderas Bay and Los Arcos Islands. New - Magestic and modern 5 bedroom oceanbront luxury villa atop the jungle hillside of Real de Conchas Chinas, 5 minutes from Puerto Vallarta. Indulge in the villa experience. This breathtaking villa was inspired by the beautiful San Angel Hotel in Mexico City. Laced with a a patina of a bygone era, this romantic and stylish five bedroom, 6.5 bathroom Puerto Vallarta renaissance hacienda is uniquely BOTH classic AND contemporary. Magestic and modern 5 bedroom oceanbront luxury villa atop the jungle hillside of Real de Conchas Chinas, 5 minutes from Puerto Vallarta. Poised on an oceanfront cliff above the Pacific Ocean, Villa of the Crescent Moon offers 6 luxurious bedrooms with an extraordinary view of Banderas Bay and Los Arcos Islands. The Fabulously private Quinta Crescencia is nestled in the side of the Sierra Madre Mountains overlooking the Bay of Banderas and Puerto Vallarta. Overlooking the Church, town and valley gulch of Puerto Vallarta, this romatically cinematic view is unobstructed and endlessly moving. Despite its dramatic cliffside jungle setting, Casa San Sebastian is only ten minutes from the international glamour of sophisticated Puerto Vallarta. Mismaloya's newest and brightest jewel is Villa Mandarinas. This architectural masterpiece cascades down six beautiful tiers of native vegetation, dramatic cliffs and colorful gardens overlooking the beach and cove where The Night of the Iguana was filmed. Indulge in the villa experience in the breathtaking villa inspired from the beautiful San Angel Hotel in Mexico City. 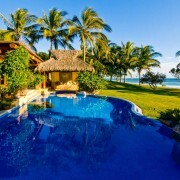 Villa Conchas Chinas 2 is a luxury beach estate in lower conchas chinas. Enter through antique One of the most spectacular beach properties in Puerto Vallarta. Casa del Quetzal is a luxury five bedroom, 5 1/2 bath, 3 level, approximately 8000 square foot hacienda style Mexican colonial home. A glittering showpiece of jaw dropping luxury overlooking Conchas Chinas and the Bay of Banderas, Villa Anastasia is 20,000 square feet of opulance with no peer. This lovely lower Conchas Chinas beachfront vacation rental villa is a few short minutes from the action of downtown Puerto Vallarta. 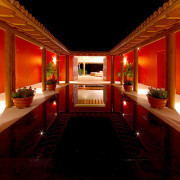 Two deluxe villas, located on a quiet, private, sandy beach near the Camino Real Hotel. The ocean views are spectacular and an ideal setting for relaxed and elegant entertaining. 5 bedrooms all featuring flat screens and a hot tub looking over the ocean. You may never want to leave this villa. Villa Esplendora could be THE bargain gem in it's class. Imagine yourself in a private and glorious oceanfront estate overlooking the beautiful Bay of Banderas, the gentle blue bay that beckons travelers to world famous Puerto Vallarta. Set atop sophisitcated Real de Conchas Chinas, this modern and romantic jungle retreat has a mezemrising view of downtown Puerto Vallarta and the bay. 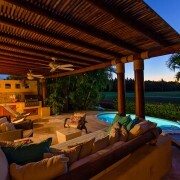 These beautiful villas are situated atop the most prestigious area of Conchas Chinas, Puerto Vallarta. 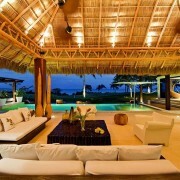 Spectacular beachfront villa located next to the famous El Set restaurant in Lower Conchas Chinas.